Eudora, however, is a Velcro baby. She’s happiest when she’s stuck to me, and makes a screech like peeling back Velcro when I try to put her down. That means that I’ve had a lot more adventures in babywearing with her… even though these adventures have been of the more mundane sort, like a walk around the neighborhood, shopping, and things of that nature. 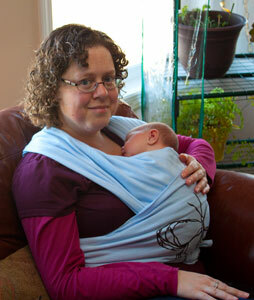 I’ve also worn her in our Moby wrap when trying to eat dinner at my mother-in-law’s house. It’s funny; with Norton, I always thought that babywearing around the house was something that other people did. People who were more into green parenting than me, people who were somehow more into crunchy parenting than me… You know, people who were just plain more mom than me. I thought it was a trend statement that just never worked out for me and Norton. With Eudora, though, I have a different perspective: sometimes, babywearing is done out of necessity. I’m not particularly in love with having her attached to me at all times. There are times that I would love nothing more than to have her let me be so that I could do stuff. But at the same time, I have this feeling of being needed by her that I never had with my boys. And that’s pretty nice. Even though I’d like to wear her a little less, her love of being attached to me has me looking forward to adventures in babywearing with both of my kids. I’m really looking forward to attempting a hike with Norton in the Ergo carrier on my back and Eudora in the Moby wrap on my front. It’ll make some of my shorter hikes a bit more challenging, and it’ll be a way for my babies to get to enjoy the woods. Have you had your own adventures in babywearing? What was your preferred carrier or wrap? At first, Poppy loved being held but hated being worn. When she was about 3 months, she started liking the sling. Now that she is bigger, she likes the Moby. She also loves her new big girl back pack! My daughter loved to be worn too. She was born in January though so as a newborn we weren’t out and about, I was cleaning the house and doing laundry while she slept on me! As she got older I wore her to places which was great. Glad to see you are able to have so many fun adventures!